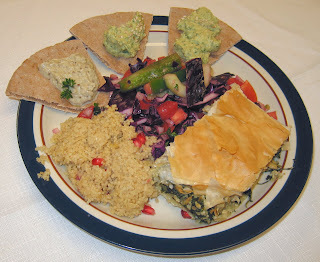 Tonight in my cooking class, my students prepared tasty Greek and Mediterranean dishes. We had spanakopita with fresh spinach, a flavored pesto tofu, onions, spices, and filo dough; I couldn't find it, but sometimes also use Sunergia Soyfoods' organic vegan "feta cheese". It came out nice and flaky with good flavor. We also had a (too?) garlicky "green hummus" (by mixing in parsley to the main ingredients like tahini, chickpeas, and garlic) and baba ganouj (similar but roasting an eggplant and using it instead of chickpeas). We had couscous sprinkled with fresh pomegranate kernels and a delicious Greek salad with cabbage, Kalamata olives, bell peppers, and other vegetables, plus lime juice and olive oil. Not shown here, we had chocolate baklava as well, always a hit; this time the bottom got a little burnt, so I need to update my recipe I give to my students to specify top oven rack baking. We had a very nice anniversary dinner last night at Il Palio, one of our area's finest Italian dining restaurants, associated with a European style boutique hotel. I arranged with the chef a 3-course vegan menu. They started with an additional simple but tasty arugula salad course that the chef wanted us to try. They had quite fresh arugula and mixed in some olive oil and a lot of lemon. Then we had an excellent polenta dish. The polenta was in the shape of thick triangles and was sauteed, and served with crispy sauteed mushrooms - wow! After one more main course, a tasty sorbet finished up the meal. My wife and I had a class we were attending at 6:30p so had to hurriedly get dinner put together. I heated the delicata squash from Friday and used Thursday's collard green-fingerling potato dish as a base for a new dish. For this dish, I quartered about a dozen Brussels sprouts and sauteed them over medium heat; a few minutes into the saute, I added a little cubed onion. Once the Brussels sprouts were showing a little browning, I added the leftovers and heated them, mixed with the sprouts. It was a good dinner that didn't take long to prepare. By the way, tomorrow is our anniversary! We will probably eat out, maybe at Il Palio or Azitra. I teach cooking on Thursday; in any case, our come remodeling comes to my kitchen Thursday morning, when the textured ceiling will be scraped and painted, and crown molding put in. Hopefully, we can get back in to the kitchen on Friday or Saturday. Even then, dinner may have to be out on Friday, as I teach a photograph class Friday evening. Tonight, I came up with the idea of making a hash with polenta that I cubed fairly small, and some frozen potatoes with red pepper and onion (really a Potatoes O'Brien). I started the polenta, which I had purchased as a prepared log, sauteeing for a few minutes, along with a very small interesting locally-grown garlic bulb that I had cut into small pieces. I then added the frozen potato mixture, as well as thin strips of seitan (most of a box). As the potato started being cooked and the polenta got slightly browned, I added a lovely small red bell pepper, cut into medium chunks. 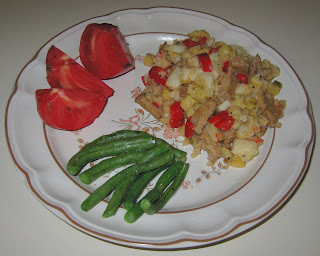 A few minutes later, I served the hash, along with green beans that had briefly been sauteed and then served with some fresh lime juice, as well as salt and pepper. Wow - I loved the hash! Yesterday, we decided to have a relaxing day in anticipation of our anniversary coming up this Wednesday. We had great weather and enjoyed hiking the trails at nearby Occoneechee Mountain State Natural Area with two good friends of ours (the Best Man from our wedding and his wife). We visited the newly opened Hillsborough branch of Weaver Street Market Cooperative grocery store, where my wife had a light, very early dinner and I had a little salad pumpkin pie. We visited my parents on our way home; my Mom offered some chickpeas that she had prepared, so I completed my here-and-there dinner by heating some stuffed Indian paratha bread and enjoying tomato slices and the chickpeas. I also didn't cook on Saturday. We had a nice opportunity to see a beautiful classical Iranian concert by the Safahan Music Ensemble, an all-women group. After that, we stopped by Broad Street Cafe, a nice smoke-free club, where they have a number of items in a vegan menu. We had a good cheeseless pesto pizza with a variety of toppings. We're enjoying a bit cooler weather, and what better way to welcome the onset of autumn than with baked squash? I cut and seeded acorn and delicata squash and, cut edge down onto a plate with 1/2" or so of water, I baked them in a 375°F oven for about 30-40 minutes. 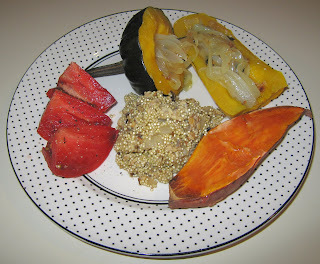 I also cut a sweet potato in half and baked it for about 10-15 minutes longer. When I visited Italy last October, I learned the technique of cutting onion and simmering on low heat, covered, in a little bit of olive oil. I did just that with half of a medium onion that I had cut into 1/4" half moons. After about 20 minutes, I added a sprinkling of basil, oregano, and rosemary from my garden, as well as some garlic gold and salt, and cooked for another 5 minutes. 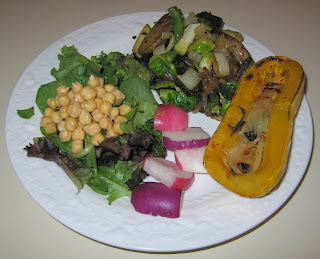 I served the onion mixture within the cooked squash halves. I also sauteed about a third of a package of tempeh for a few minutes till it gently browned, then added a little bit of medium diced onion. I cooked a few more minutes, then added, in a 1:2 ratio, quinoa and water. I brought to a boil, added some salt, and cooked on low heat a little over 5 minutes till the quinoa was done (you can see a white ring form on the grain). Dinner was good! Tonight I decided to use up the collard greens that I had found that my wife had recently purchased. Not long ago, I had picked up a bottle of an organic macadamia nut oil (by Jungle Products). I sauteed in the macadamia nut oil maybe ten small fingerling potatoes that I had cut in half; a few minutes into the saute, I added a medium red onion, cut into thin 1" or so slices. Once the potato was nicely browning, I added some lavender bell pepper slices and cooked for another minute or two, then added some cumin seeds. I removed this all from the heat a minute later. In the meantime, I hand tore the leaves from the stems of a bunch of collard greens, and cut the greens into roughly 1 1/2" squares (the stems are destined for my compost pile). I started about a half or 3/4 cup of water boiling; I would have dissolved in a vegan bouillon cube, but was out of them. I added the greens and cooked, covered, reducing the heat to a simmer. After about 7-10 minutes, when the leaves were nice and dark green and tasted done, I poured out the cooking liquid into a cup that I served my wife to enjoy with dinner. Into the pan of greens, I now mixed in the potato-onion mixture, as well as maybe a dozen small oregano leaves, a little salt and paprika, and a pinch or two of dill weed, as well as between 1/8 and 1/4 cup organic Baja lime marinade. It turned out to be quite good! 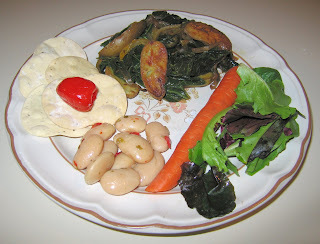 I also served some marinated white beans that I had purchased from the olive bar at Whole Foods. I often shy away from beans as they can upset my stomach, but recently I've not had so many problems, so thought I'd try it. They were also good. I also served a salad and imported Italian Mulini Reali organic hand-rolled rosemary crackers. 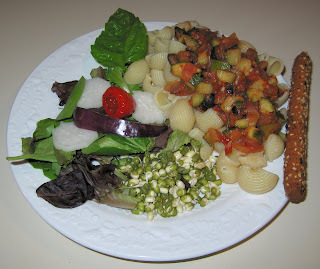 Tonight, I used up some caponata sauce that I had left. I sauteed a zucchini that I sliced medium-thin (maybe 3/8"), then mixed in the sauce and some chunks of green and black olives. I served the sauce over organic conchiglie seashell-shaped pasta. My wife and I had a 6:30p appointment (which we didn't make - we were driving and about 10 minutes away witnessed a multi-car accident that we were just behind; I pride myself on being a defensive driver so we had no involvement at all, but we stayed at the scene as witnesses till the police dismissed us) so I hurriedly put together an early dinner. Having leftovers from eating out on Sunday helped; I also made some corn-off-the-cob with Earth Balance margarine, lime juice, salt, and paprika. I didn't cook dinners this weekend. On Saturday, my wife and I had a number of errands and then went straight to a nice vegetarian society potluck dinner, only stopping at Whole Foods to pick up some amazing Turtle Island coconut milk-based Purely Decadent brand vegan "ice cream", as well as some prepared pakoras. I had looked forward to making a nice dinner Sunday night, but my parents wanted to take my wife and I out to eat. We went to Sitar India Palace. I do like Indian food, but don't generally eat it with the regularity that I have been since Thursday's cooking class meal. Also, I knew I'd be eating at Tower South Indian Restaurant (eating out again! Indian again! but I never seem to tire of Tower or Udupi) today for lunch, as I taught in the morning then had an afternoon tutoring session to present, and Tower is just down the road from where I teach. Anyway, we had some appetizers, including a potato tikki, salad, and idli; I had a chickpea dish (a bit spicy!) and shared some of my wife's tasty rice. Tonight, I was happy to be back in my kitchen. I had an avocado which had to be used, so made a simple salad - I just cubed it as well as part of a tomato, and mixed in a little lime juice, salt, black pepper, a little red onion (cubed), and fresh rosemary. I made a simple asparagus and tempeh saute, adding rice noodles (that I had first soaked in hot tap water then drained) for the last two or so minutes. Earth Balance has a new peanut butter line, which has flaxseed oil in it. 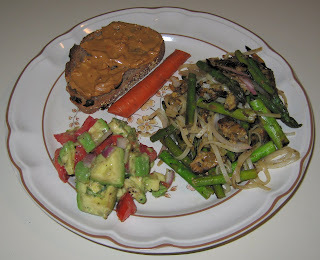 The peanut butter doesn't have to be stirred or refrigerated. And it tastes good! It's sweetened with a little bit of agave. I lightly toasted some whole wheat sour dough walnut-raisin bread, and served it with some crunchy Earth Balance peanut butter - yum! My wife and I thought that The whole dinner was quite good. By the way, our talented webmaster now has a page up to our podcasts - trianglevegsociety.org/podcast/. A recent talk that I gave, Why Vegetarian, now appears there. Tonight, dinner was quite late. I taught a photography workshop from 5-7p and was planning on meeting my wife for a quick dinner enroute to the 8p NC Museum of Art fall film series (Homage to Film Noir) to see the 1947 British film It Always Rains on Sunday. I got out late and my wife didn't join me, so I went, hungry, straight to the film. It got out just late enough that I missed some good dinner stops, such as South Indian restaurants, and I returned home around 10:15p. My wife had eaten leftovers, so I was on my own. 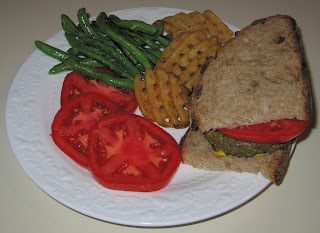 I got some waffle French fries going in the toaster oven and grilled a Garden Herb Organic Sunshine Burger. I also served some green beans Tuscan style by briefly cooking them in a little bit of olive oil, then sprinkling some fresh lime juice on top, as well as some salt and pepper. 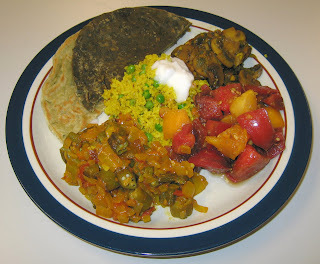 Tomorrow, we are going to a vegetarian society potluck dinner. I expect to be cooking at home on Sunday. We started class a half hour early today at the request of a student so that we could see tonight's Vice Presidential debate. I continue to be amazed at this group - not only do they make it so easy to get food on the table early, but they work calmly and confidently without seeming hurried and, most importantly, the dishes come out great. Tonight may have been the best Indian night of any class I've taught. 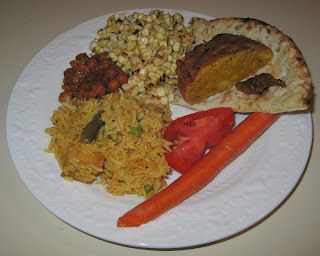 They cooked a rice pilaf with cashews, a pureed spinach-tomato dish (palak tamatar), curried mushrooms, bhindi (okra), and a tomato salad with freshly ground cumin seed that was a favorite of my Nanaji's (maternal Grandfather) and made especially good with a mixture of heirloom tomatoes. 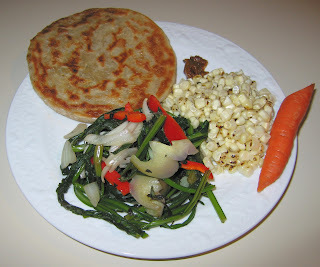 I brought a pack of spinach and another of puff onion frozen paratha breads, which the briefly pan cooked, some of my Mom's homemade lemon pickle as well as some commercially available mango pickle, and typical packaged spicy snacks for them to nibble on as they cooked. They also made chai with hemp milk and chocolate tofu pies with mixed berry preserves. We had a little coconut milk-based yogurt with the rice. It was a great meal - they did a particularly good job with the mushrooms and salad, I thought. My wife had mentioned that this past weekend she picked up lacianoto kale, but I didn't see it; today, I found that she had purchased dandelion greens. I had not cooked with these bitter greens before, but tried boiling them, as I had read on the internet. I boiled the greens, sliced in half, for a short while, maybe 4 minutes, till the leaves turned darker green. I then drained the pan and tossed in some bell pepper slices, slices of maybe 1/3 a medium onion, a few shakes of my ume plum vinegar container, and a little salt. The dish was fairly bitter, but my wife liked it!